The NFC South wasn’t the fantasy juggernaut many expected last season, in large part due to Atlanta’s regression without play-caller Kyle Shanahan and an injury to Jameis Winston that derailed the second season in Dirk Koetter’s vertically aggressive offensive scheme. The Saints passing game was the least efficient it has been since Drew Brees arrived, in large part due to the efficiency of their defense. The Panthers and Cam Newton rebounded with the addition of Christian McCaffrey in the passing game. In 2018, things won’t look much different in the NFC South. Winston is not injured, but he is now suspended for the first three games. The Falcons will return the same offensive scheme with the addition of talented first-round rookie wide receiver Calvin Ridley. The Saints deal with Mark Ingram’s four-game suspension but have also added under-the-radar wide receiver Cameron Meredith to the mix. The biggest change will come for the Panthers as they transition from Mike Shula’s horizontally attacking offensive scheme to a vertically attacking offensive scheme under Norv Turner. Over the next few weeks, we will preview every division and pinpoint four to five players to track during training camp and the preseason. From now until the start of the season, the only real information we’ll need to gather is about a player’s role and chemistry within his offense. You can find all the previous divisions here. The goal is to provide you with players to add to your targets list now for season-long leagues, but also with players to target or avoid in best-ball drafts that are currently underway on DRAFT and MFL. Today, we’re tackling the NFC South. 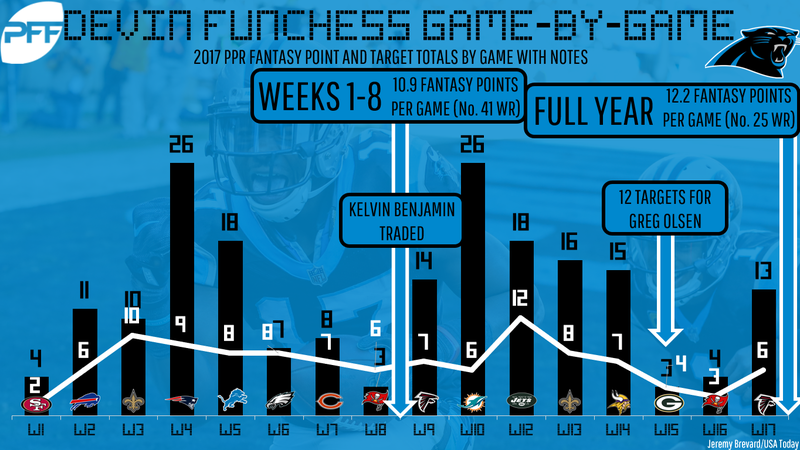 Funchess finally showed signs of coming into his own in the absence of Kelvin Benjamin last season. Panthers general manager Marty Hurney credited Funchess’ improvement to a position switch taking over as the “X” receiver for Benjamin. Funchess racked up eight touchdowns despite the fact that he only once topped 100 yards receiving. The addition of rookie wide receiver D.J. Moore could help provide Funchess with more one-on-one coverage situations. Injuries have plagued Funchess, and although he appeared in all 16 games last season, he played hurt through several games. Despite the progress Funchess made, he is currently viewed with WR2 upside following the team’s addition of Moore in the first round of the 2018 NFL Draft. Although Funchess’ raw targets never jumped off the page, he performed exceptionally well in several efficiency advanced stats we will touch on below, including one that meshes well with Newton’s skill set. The 24-year-old is coming off a breakout season and the only pass-catcher who has developed more chemistry with Newton is 33 years old and missed most of 2017 with a Jones fracture (Greg Olsen). What to watch for: Newton and Funchess developed a clear rapport in 2017, but it never translated to a high volume from a targets standpoint due to Funchess’ health. For starters, you’ll want to see that Funchess is healthy and ready to go. In order to enjoy a breakout season, Funchess will need to emerge as the clear-cut preferred target in camp.